It’s the summer of 1971 and my first trip to San Francisco. Last year at this time I was flaunting my long hair, listening to rock’n’roll and getting stoned. Now, but for my sikha, my head is bald, I follow the regulative principles of bhakti yoga and I am an initiated disciple of a bona fide spiritual master in a line of succession from the Supreme Personality of Godhead -- what a transformation! Bhakta dasa and I are in the advance party from San Diego and we arrive in the middle of the night, so we decide to sleep in the van in front of the blue and white temple on Valencia Street. The next morning we rise a little late and enter the palace of the Lord. There’s a book display room to the left of the entrance and a small office to the right. The office door is open and Kesava, the temple president, is on the floor, wrestling with another devotee. I think this a bit odd but soon give in to the fact that the Bay area bhaktas are not your typical skinny brahmanas but a brawny, street-tough breed of Vaisnava that you don’t want to mess with. The temple is a fairly large structure that had previously been a mortuary. The two-story lobby has a curved staircase leading to the second floor wherein the kitchen, brahmacari quarters and other rooms are located. The temple room (under renovation) is on the ground floor, and across the way is another large room that is outfitted with sliding dividers, allowing it to be converted into two long narrow halls. One side is used as a lecture room, containing a Vyasasana for Srila Prabhupada, and the other side is used as a prasadam hall. We clean up and attend the balance of the morning program. The temple is abuzz with devotional activities, and for good reason. It’s almost time for Jagannatha Swami to emerge from seclusion after recovering from a bothersome cold. Most appropriately, the appearance of the Lord of the Universe will be preceded by the appearance of the Spiritual Master of the Universe, His Divine Grace A. C. Bhaktivedanta Swami. Every devotee within 500 miles has converged on the Bay area like bees to a lotus, anticipating the appearance of these two Swamis. There must be close to three hundred devotees and some say it may be the largest gathering of ISKCON devotees to date. It’s certainly the biggest assembly of Vaisnavas I’ve ever seen. After the morning program we approach the busy, yet cordial, temple commander with folded hands and beg some service. He checks his clipboard and assigns us our duties. This is standard procedure. Prabhupada has taught that we are servants of the Lord, and that’s the main reason we’re here. If we’ve come just to enjoy the festival or see Srila Prabhupada or socialize, we’ve missed the point. I can’t deny that I do desire these things but they must remain secondary. Our main business is service to Krsna and His pure devotee. I report to the kitchen to help prepare the bhoga. After several hours of stirring grain for halava and cooking down the Eggplant Balarama subji, I clean up and join in the evening programs. Until Prabhupada arrives, Vishnujana Maharaja takes the spotlight. His melodic kirtans and straight from the heart lectures enchant everyone. We also have a reading from an unpublished Bhagavatam manuscript about King Puranjana -- a segment of the fourth canto that Prabhupada recently finished translating. At this point in time we’ve only had the brown cover, Indian edition of the first canto and a few paperback editions of chapters from the second canto to study, so this sneak preview is a rare treat. After the reading and hot milk prasadam the devotees take rest. In the pre-dawn hours of the morning, I stand in a long line, waiting to use the one and only men’s bathroom as Karandhara, the GBC secretary for the West, monitors his watch to make sure no one takes more than their allotted time to shower. Many scores of men use the sole bathroom facility that morning and somehow everyone gets to mangala-aratik on time. Karandhara and his brother Kesava talk about how Prabhupada will be pleased to see so many new devotees this year. Later in the day we’re notified that His Divine Grace will be arriving soon and most of the devotees drive to the airport to greet him. Srila Prabhupada has just made a historic trip behind the Iron Curtain and now he’s on his way to San Francisco after a brief stop in LA. His plane lands and we begin singing and dancing as passengers emerge from the gate. After several minutes the chanting peaks and Srila Prabhupada makes his grand entrance amidst an outburst of tears, boisterous kirtan, devotees dropping to the floor, devotees leaping over airport furniture, frantic shouts of "Prabhupada! ", and miscellaneous chaos. This is my first glimpse of Prabhupada, the moment I’ve been waiting for -- not just since I became a devotee but since I fell to the material world. Walking now before me is that great personality who awards freedom from the misery of material life. I feel a chord of relief, gratitude and happiness as I sink to my knees and offer my respects, crying without reservation. Upon returning to my feet and wiping my eyes, I realize the time spent in emotional indulgence has rendered me a straggler -- Prabhupada, his entourage and most of the assembled devotees have moved along without me. I run to catch up and discover I have to keep running just to match pace with Prabhupada’s demanding cadence. It’s incredible! The devotees are jogging to keep up with Prabhupada, but he’s just walking! His stride can’t be greater than ours because he’s considerably smaller than most of us. He seems unhurried but somehow he’s moving faster than everyone else! After adjusting my speed to Prabhupada’s, I jockey for a choice position in the tight phalanx that surrounds His Divine Grace but I’m new at this, and the veterans aren’t about to relinquish their turf. I settle for a spot in front of the pack and off to the side as I jog sideways and even backwards so I won’t lose sight of my spiritual master. One devotee holds a red velvet umbrella over Prabhupada’s head (as if he needs protection from the fluorescent lighting). In addition to the traditional flower petals, a couple of devotees cast yogurt and raw grains of rice in Prabhupada’s path, probably extrapolating the idea from something they’ve read in the Bhagavatam. These things seem almost comically out of place at the San Francisco airport, but who cares? Prabhupada sails through the joyous uproar as if driven by a strong wind. This is wonderful! Who can imagine such a scene? We gush through the terminal like a saffron tsunami, absolutely oblivious to the awestruck passengers, each of us hoping with all our heart that Prabhupada will look our way. When Prabhupada arrives at the temple the devotees crowd around him like adoring fans mobbing a big Hollywood movie star. Someone snaps a picture of His Divine Grace as I stand behind him trying to get a glimpse of his splendid golden face. We proceed to the lecture hall and Srila Prabhupada ascends the asana to speak. …and fade to black. My old nemesis, sleep, attacks almost immediately and I’m disheartened to be in the throes of Maya’s spell on such a special occasion. After several minutes of straining to stay awake, I decide to take desperate measures. I unlatch the safety pin that holds the counter beads on my japa bag and prick my thigh several times with the pin. Even that doesn’t work. I must be dead -- a lifeless, insensitive corpse! How could I doze off the very first time I have a chance to hear my spiritual master? I continue to fight a losing battle, and before I know it, Prabhupada’s lecture is over and I’ve barely heard a word. As Srila Prabhupada stands to come down from the Vyasasana everyone bows and offers obeisances. It is my special fortune to be right on the aisle. Before finishing my prayers I turn my head slightly left to sneak an ant’s-eye view of His Divine Grace. Everyone is still bowing but several devotees stretch their arms out to receive that most coveted blessing. 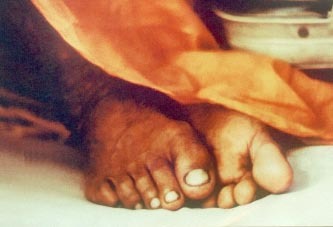 Adorned in orange cotton, the feet of the perfect soul slowly approach me and I decide to go for it. Careful not to impede his step, I reach out and gently place my hands around his ankle and over his right foot. Does it feel any different than someone else’s might? I don’t think so. There are no sparks. No transcendental auras. Nevertheless there is a difference. These are the lotus feet of the pure devotee -- eternally free from all material contamination, the vessel of pure Krsna consciousness. For a moment and a half my hands are allowed to embrace the sacred foot of that divine personality whom God has chosen to shelter the world. I would discover later I was even luckier than I knew for this was the end of the era when crowds of devotees were allowed to touch Prabhupada’s feet. I never again witnessed such an occurrence.